You can never have too many things with you on your wedding that serve as “just in case”. 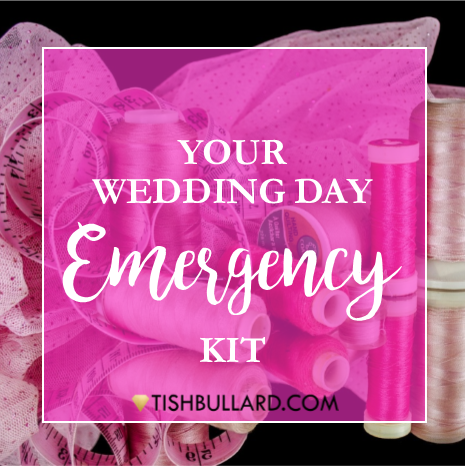 Small mishaps occur and by taking time to prepare a Wedding Day Emergency Kit you can be ahead of the bride game. Having this kit on hand will also save you time from having to make impromptu trips to the local drugstore right before you walk down the aisle. Here are a few key essentials that can make a huge impact on your special day. Bandages-this is an emergency kit essential. Peppermints-you will be kissing your honey, right? Deodorant-stress sweat or not, this is an emergency kit essential. Lotion-no dry skin on this day! Cash-it’s good to be prepared. You may want to tip one of your vendors or purchase something on the go. Q Tips and Makeup Remover-makeup mishaps occur, too. ToothBrush & Toothpaste-you will be smiling and talking all day, this will help you. Don’t let the list overwhelm you. Choose a few things to purchase over time to add to your emergency kit. Do you have any other items that you might add to this list in your kit? Tell us what you will add.